Kicking back and just passing the time, Adrian Rosu flipped open his laptop and called up YouTube. But before he could watch the video he wanted, Rosu had to listen to a pitch from someone selling drugs. Rosu can’t recall the name of the medicine the person in the ad was peddling. But it didn’t take him long to decide he wasn’t buying it. In the sales pitch, the hawker pointed to a pile of papers and testified that a stack of doctors endorsed the medication. Which doctors? Where did they get their degrees? What are their specialties? Are there even names of doctors on those sheets of paper? The questions zipped through Rosu’s mind. Majoring in philosophy will do that to a person — you get to recognize a strong argument from a weak one. 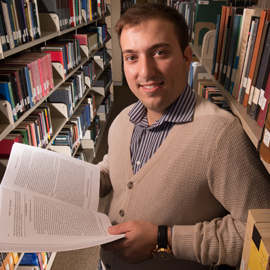 “It becomes almost second nature,” said Rosu, a master’s student in philosophy at Laurier. Sure. That’s a really simple example. After all, who hasn’t shot down an online huckster? But the ability to pose good questions (repeat: good questions) and make solid arguments isn’t kid stuff. And those skills come in handy every day: when buying a car, signing a contract, weighing ethical and political arguments, or just trying to figure out what to do with your life. Ever since he was a kid, Rosu knew he wanted to be a lawyer. So as Rosu grew up and learned that philosophy grads score well on law school entrance exams, he was sold on the idea of studying philosophy. And a brief chat with a professor, during a tour of the Waterloo campus, convinced Rosu that Laurier was the place for him to study. With only about 130 students and 10 faculty, the Philosophy department’s learning environment is fairly intimate, says Rebekah Johnston, associate professor and chair of Laurier’s Department of Philosophy. Undergrad students get a solid grounding in 3 areas: the history of philosophy; values, politics and ethics; and metaphysical and epistemological questions (how can we truly know something?). As Rosu had heard, philosophy graduates tend to score well on law school admission tests. But grads aren’t limited to going to law school or grad school: they have also gone on to work in public service and business. In Ontario, philosophy is also among the teachable subjects for high school teachers. In short, Johnston says, philosophy equips you for any job that entails detailed critical thinking.